The Sierra Nevada Logging Museum is located adjacent to White Pines Lake, on the historic site of the Blagen Sawmill community. The nonprofit museum is dedicated to telling the story of loggers and logging-related industries in the entire Sierra Nevada region of California—from the discovery of gold in 1848 to the present day. 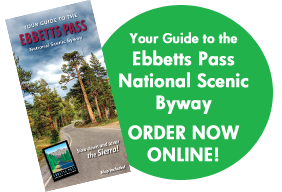 The geographic scope of the museum encompasses the 18 counties of the Sierra Nevada range, from Lassen County in the north to Kern County in the south. The museum boasts indoor exhibits including a diorama and many informative displays, as well as outdoor interpretive trails highlighting an impressive collection of historic logging equipment, including a Willamette steam donkey, a “two-man” sawmill, an impressive 1920 Shay logging locomotive, several enormous logging arches, Caterpillar tractors from the 1930 to 1960s era, and many others. 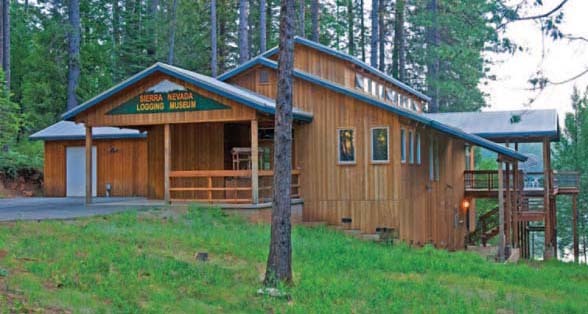 Construction of the Sierra Nevada Logging Museum began in 2000 by the non-profit Friends of the Logging Museum, and through the spirited efforts of volunteers and donors, the museum continues to grow in exhibits and offerings. Learn about the history of logging and lumbering throughout the Sierra Nevada, and enjoy the picnic area and trails that surround the museum grounds and White Pines Lake. There is an intimate amphitheater where historical talks are presented. The museum is open by appointment during the winter season and from Thursday-Sunday, 12 to 4 p.m. when the weather warms up. Admission is free. 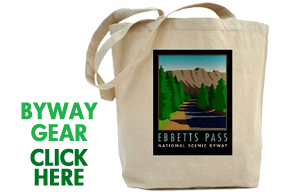 Call (209) 795-6782 or visit sierraloggingmuseum.org for more information. The Sierra Nevada Logging Museum is well worth the short detour off the designated Byway. To get there from Arnold, turn north from Highway 4 onto Blagen Road, travel one mile to Dunbar Road in White Pines, and turn left. The Museum is on the right overlooking White Pines Lake. Fishing, non-motorized boating, picnicking, hiking and lounging are perfect complements to a lingering visit to the museum.